The value of a Ram Tank - 13 cents 1942 stamp depends on several factors such as quality and wear, supply and demand, rarity, finish and more. Values in the section are based on the market, trends, auctions and recognized books, publications and catalogs. This section also includes information on errors and varieties and characteristics. 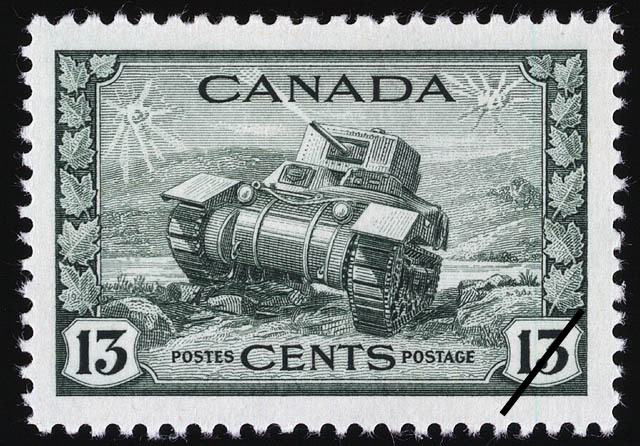 During the early days of the Second World War Canadian Postal authorities believed that the stamps in use since 1938 should be replaced with a new issue featuring Canada's substantial contribution to war work. A new general issue to last for the duration of the hostilities was designed. Subjects depicting Canada's munitions, war supplies, shipbuilding, agriculture, her importance as a great air-training centre, and as a source of food were chosen for the pictorial stamps. "Ram" tanks of the Canadian Army, named after the Rocky Mountain ram, were produced in Canada by the railway equipment and locomotive manufacturers. The Ram tank, weighing 32 tons heavily armed, was probably the 1st piece of armament of a specifically United States type produced in Canada. It was patterned after the commonly known General Lee tank developed in 1939 in the United States. After actual combat in Libya, the design was materially modified; it had a maximum speed of 25 miles per hour.